**My Desert Cottage**: Shabbylicious IS SHABBYLICIOUS!!! 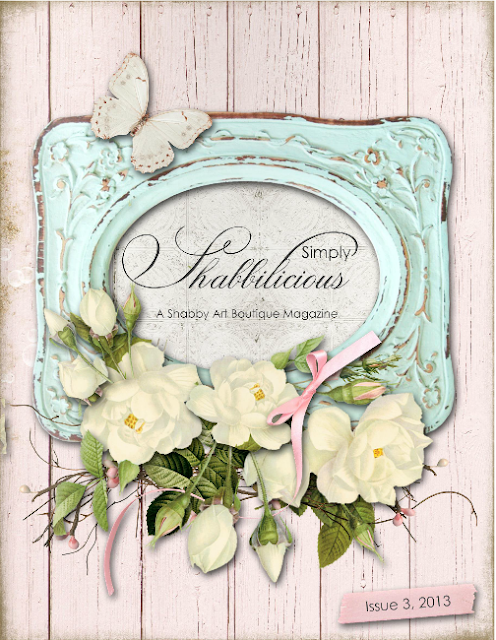 I'm so thrilled to let you know that my studio is featured in the new issue of Shabbilicious Magazine!! If you are not familiar with the publication, you should go check it out! It is published by a very sweet lady named Kerryanne in Australia and she does a beautiful job putting it all together. The magazine is available in both digital and printed formats, but the best part is.... the digital issue is free!!! It is chock full of beautiful vintage and shabby chic decor, projects and ideas and also some really great vendors that are just kinds of things we all love! I was very happy to see that in addition to all the the other lovely ladies that are in this issue, Rebecca from A Gathering Place is also in it. She has a wonderful studio and has shared it many times during the Where Bloggers Create tour. You can go check out the issue by clicking on the image above. I think you'll love the magazine and will want to see lot's more issues in the future! I saw your studio when Kris of Junk Chic Cottage sent me a link to Shabbilicious. Your studio looks great in the magazine. Well, look at you, they knew a "good find" when they found you and your work. I'm on my way to check it out now. Happy Sunday! Your studio is beautiful..Congratulations Karen.. I went through the magazine before commenting and it's a very nice feature, congratulations. It was also nice to see Rebecca in the magazine. How exciting for you! I so see the digital version...and it gorgeous! Oh congratulations, it's definitely well deserved. I showed my husband the image rendering you did of the piece of furniture and he really likes it, so I guess it's getting painted. Thanks for your help, and......hey, when are we gonna get together again? Congratulations! I do not know this magazine but I am going to have a look. Your blog is so lovely I can only imagine how wonderful your new studio is. I can't wait to check out the online version of the magazine - thanks so much for sharing the link! I saw your feature and it was wonderful!! Love this free magazine, it is always full of wonderful ideas! My daughter was visiting and I had to show her your blog... congrats on your beautiful space being picked and published!!! I was so happy to see Kris in the same publication... great spaces, creative minds, shared souls!!! a Lovely Magazine! And so enjoyed viewing your beautiful studio in it! Congratulations and thankyou for introducing me to this beautiful magazine! and the pictures of your studio look so great here!! Thank you for sharing the digital issue. I'm very happy for you, I'll check it out. I am back running again so come visit. After my surgery I'll get with you. I want a new background. What a lovely display of your studio and you looked beautiful also in the magazine photos, Thanks for shareing the link Karen. Congratulations for being chosen in the magazine . Cingratulations Karen. A perfect fit for you both. Great article and pictures, congratulations!!! !